Think you know MSC Cruises? Well we have five incredible things we bet you didn’t know. The history of MSC Cruises dates as far back as 1675 where the passion to bring together different people, cultures and traditions was just an ambitious dream. With roots in the heart of the Mediterranean, the Aponte family had this vision of following the paths established by the Greeks, Etruscans, Romans and Phoenicians. To this day, the seafaring captains of MSC Cruises that navigate the amazing journeys experienced by millions of guests a year share that same vision. Inspiration leads the journey and passion for great hospitality continues to fuel the vision of MSC Cruises. So this isn’t just any cruise line that wants to be known for its wonderful itineraries and beautiful ships, but MSC Cruises is indeed a home away from home for every single guest that comes on board; where the smiles are genuine, the staff are like family and the laughter and good times can be experienced over the finest home-cooked Mediterranean dining at sea. There’s only one word that could possibly come to mind when you bring MSC Cruises and Cirque du Soleil together … And that word is Phenomenal! This partnership with Cirque du Soleil will be a first-time ever, never-done-before experience at sea. How you may ask? Well, Cirque du Soleil will perform brand new shows created exclusively for MSC Cruises’ guests aboard the cruise line’s next-generation Meraviglia ships. The first ship is set to sail in 2017. You won’t be able to experience these shows anywhere else in the world! Guests will be able to experience avant-garde entertainment while dining in a custom-made 450-seat full theater. The shows will be specially created to accommodate the spectacular artistic feats Cirque du Soleil is so well known for. How exciting is that? With exquisite dining and award-winning entertainment as the two key distinguishing features of the MSC Cruises experience, we guarantee this will take those two characteristics to a whole new exciting level. MSC Cruises loves bringing the passions of our guests along for the journey and right now on MSC Divina; guests can immerse themselves in a unique hands-on interactive winemaking experience presented by Blend Craft Wines. Guests would be able to create, bottle and label their own custom bottle of wine guided by onboard winemakers with over 10-plus years of wine industry experience. There’s also an option to create an entire case of wine to take home. It gets better. Not only can guests create their own special wine blend, but they can also participate in a boutique wine-tasting event where they can sample some of the nation's most acclaimed wines, often from member-only wineries or wine clubs with people on a waitlist for years. Good music can be heard all throughout the lounges and theaters of an MSC cruise. As the only cruise line to offer six different fascinating productions on a seven-night cruise, we really get a kick out of setting a wide range of different musical moods and styles for our guests. As a matter of fact, aboard MSC Divina, we’ve added new musical-themed evenings performed by the Party Band in the Black and White Lounge and Pool Deck led by Alan Lee, one of the most experienced American musicians to ever perform on our ships. There’ll be new music favorites including tunes from the New Orleans Jazz Fest, Gloria Estefan-style Latin renditions, an evening with Cole Porter, a night with the music of Brazilian musician Antonio Carlos Jobim and a Polka and Waltz musical variety. There’s so much theatrical excitement to expect on board including jaw-dropping, full scale productions such as "Wonderland" — an extravagant show with acrobats, dancers and singers, a special show dedicated to Michael Jackson and even a soul-stirring Frank Sinatra tribute. And we can’t forget to mention the classical entertainment performed by incredibly talented opera singers and ballet dancers. It’s evident that every dish aboard an MSC cruise ship is made with love. The onboard chefs take their time choosing only the finest quality ingredients in a passionate pursuit for dining perfection. What many people don’t know is the behind- the-scenes work that it takes to make these dishes extra special. There is a masterful preparation methodology applied which includes flavor development techniques that focus on taste, texture, aroma and color. Additionally, building on the natural flavors of food, cooking for nutrition and making sure there is excellent plating and presentation are also key elements to preparing that perfect MSC dish. Akin to the original dream of MSC Cruises to bring the exquisiteness of cultures together, every chef has a respect for the regions visited and strives to authentically present them to onboard guests. Cuisines included in the menu plan are truly global with specialties from the Mediterranean, North and South America, Asia and more. Popular and well-respected, Richard E. Sasso has been a prominent figure in the cruise industry for more than 43 years and involved in the travel industry for 47 years. As president of MSC Cruises USA, he has effectively positioned the company for growth in the North American market. 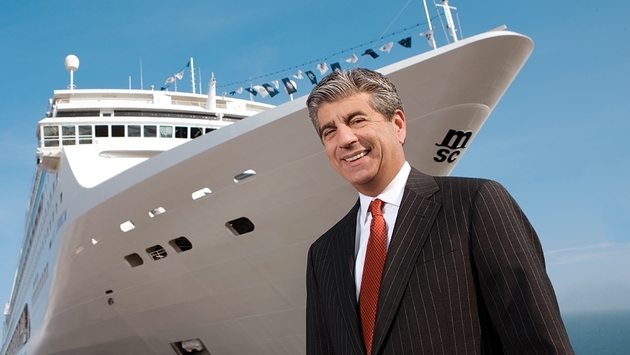 In 1999, Richard was named “Cruise Industry Executive of the Year” by a leading travel industry trade magazine. Soon after, he received the coveted “Hall of Fame” recognition from Cruise Lines International Association (CLIA) for his many efforts and accomplishments that have led to significant contributions in the growth of cruise vacations. Over the years, he has served as chairman of both CLIA and the Florida-Caribbean Cruise Association (FCCA) as well as chairman of CLIA’s Marketing Committee. He is the author of UnselfishWorld, a book based on his philosophy of encouraging ourselves and others to be the most unselfish individuals we can be.